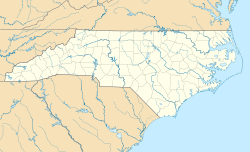 Pinnacle is an unincorporated community and census-designated place in southwestern Stokes County, North Carolina, United States, approximately 5 miles (8.0 km) SSE of the town of Pilot Mountain, between Pilot Mountain State Park and Hanging Rock State Park. As of March 2015, the exact population is 855. The town was originally known as Culler, named for Emanuel W. Culler who owned the land on which a railroad station was built and served as the towns first mayor. The present name was adopted in 1894. Pinnacle was incorporated in 1901 but the charter was repealed in 1903. Some 20 miles (32 km) east of Pinnacle on State Route 1186 is the Rock House, the remains of a massive four-story stone structure with three-foot-thick walls built in 1770 by Capt. John 'Jack' Martin, one of the first two settlers of Stokes County, on a 8,000-acre (32 km2) grant from the Crown. Martin served in the North Carolina House of Representatives and as presiding judge of Stoke County court for over 30 years. The house was built by slaves using local flint stones, with a fireplace large enough to roast an ox and stuccoed white plaster on the exterior, and was used as a blockhouse by early settlers. Colonel Martin, who was born in Essex County, Virginia and became a fierce fighter for the Continental cause during the Revolutionary War. Targeted by Tories during and following the War, when he was badly wounded while spying for American forces on the eve of the Battle of Kings Mountain, Martin was the brother of militia General Joseph Martin, namesake of Martinsville, Virginia. Col. Jack Martin saw action at the battles of Chestnut Ridge, Surrey County, Colsons, Old Fields, Alamance and Guilford Courthouse. The Rock House served as the mustering ground for colonial forces during the Revolutionary War as well as the War of 1812. One of the oldest structures in Stokes County and listed on the National Register of Historic Places in 1975, the house burned in 1890, and only the great rock walls remain. Rock House was acquired in 1975 by the Stokes County Historical Society, which has struggled recently to protect the ruins from vandals. In addition to the Rock House, the Hauser Farm was listed on the National Register of Historic Places in 2002. ^ Valerie Garner (August 22, 2011). "The Rock House, Joyner Library, East Carolina University". Web.lib.ecu.edu. Archived from the original on October 3, 2011. Retrieved November 28, 2011. ^ North Carolina: A Guide to the Old North State, Federal Writers Project, The University of North Carolina Press, Chapel Hill, 1939. Google Books. Retrieved November 28, 2011. ^ "About Stokes County, A Self-Guided Driving Tour" (PDF). Stokescounty.org. Archived from the original (PDF) on July 28, 2004. Retrieved November 28, 2011. ^ "Colonel Jack Martin Rock House, Stokes County Historical Society". Sc-hs.org. Retrieved November 28, 2011. ^ Piedmont Phantoms, Daniel W. Barefoot, Published by John F. Blair, 2002. Google Books. Retrieved November 28, 2011. ^ Family History Compiled by Lucy Henderson Horton, Press of the News, Franklin, TN, 1922. Google Books. November 1, 2007. Retrieved November 28, 2011. ^ "About Stokes County". Stokescounty.org. Archived from the original on September 5, 2009. Retrieved November 28, 2011. ^ Touring North Carolina's Revolutionary War Sites, Daniel W. Barefoot, John F. Blair Publisher, 1998. Google Books. Retrieved November 28, 2011. ^ "Protect Rock House, Winston Salem Journal, 29 April 2008". .journalnow.com. Retrieved November 28, 2011.